Ottawa seems to contain an endless supply of both historical and modern landmarks, which seem to crop up throughout the city. 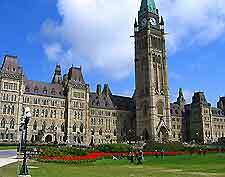 One of the most important landmarks in the city of Ottawa, Parliament Hill is the hub of Canadian politics and features a number of outstanding buildings, including a tall clock tower. 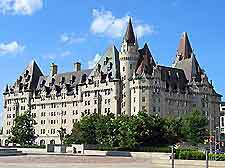 Also worth a look, further eye-catching landmarks in Ottawa include the striking Notre Dame Basilica, the Prime Minister Residence, Laurier House and Ottawa's imposing Supreme Court of Canada. 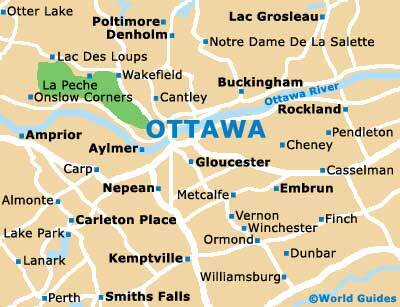 Here is some more information about Ottawa's main landmarks and monuments. The center of politics in Canada, Parliament Hill comprises a number of important and historical buildings, and is home to the House of Commons, Members of Parliament and Senate. With superb river views and Gothic-style architecture, Parliament Hill is known for its tall Peace Tower, which stands high above the Center Block, East Block and West Block buildings. The Peace Tower measures around 300 feet / 92 meters and comprises more than 50,000 stones, with an enormous clock face measuring almost 16 feet / 4.8 meters. 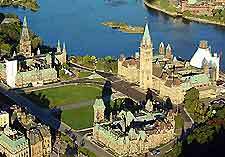 Guided tours of Ottawa's Parliament Hill are available. Laurier House provides an interesting insight into the country's political past, and was once home to Wilfrid Laurier, a former Canadian Prime Minister in the late 19th century. Once visited by world-famous English Prime Minister Winston Churchill, the house is now open to the general public and offers many period features and self-guided tours. The Notre Dame Basilica / Cathedral is an imposing building, featuring striking Neo-Gothic architecture and many historical features. 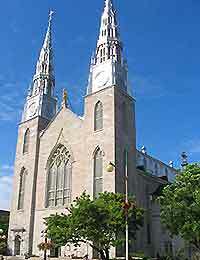 Dating back to the mid-19th century, the Notre Dame Basilica is the city's oldest church and one of the most important landmarks in Ottawa. With twin spires and an elaborate interior, other cathedral highlights include colorful stained-glass windows and many stone carvings. Without doubt the most famous address in Ottawa, the Prime Minister Residence is often simply known as '24 Sussex Drive' and stands in the city's Lowertown area. The building was built in the 1960s and is surrounded by a secure iron fence. 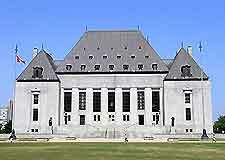 An important building for all things legal and binding in the country, the Supreme Court of Canada is open to the public, with regular guided tours available, although these should generally be booked in advance. This enormous building is situated in central Ottawa and contains a number of courtrooms and period features.